I’ve been registered, briefed, checked in, briefed again, photographed and finally I can relax; there’s nothing more to do between now and 7:30am. Nerves have yet to kick in. I remain ambivalent about the event – knowing I’ll race as hard as I can, but not fired up. I don’t know how long this casual attitude will last, tomorrow is going to be a tough day. Once again I am a little under prepared. Excuses have been made, but I knew the race was coming. Failure to perform has been this season’s trend and I am unlikely to buck it. The broad plan is survive the swim, push the bike and hang on for the run. I’ll finish and put the year behind me; I’ll start thinking about 2012 and how I can ensure I achieve my goals. This is the last time I want make excuses and accept compromised results. Swimming four kilometres will be a challenge. I lack the endurance. A shameful amount of pool time means I will be struggling by the turn around. I felt great for the first half of Challenge Henley and fooled myself I could handle an Ironman swim; two kilometres in my arms were gone. While I’ve spent more time in the water in the last fortnight than the month before it, I am far from ready for four kilometres! The swim plan is simply to survive. I can hold a comfortable pace, but have no capacity to push for any duration. It’s far better for me to hold back, go steady and get through comfortably. Not necessarily easy, there’s no way it will be easy, but not chasing a time. If it can get me a better result than Henley I’ll be happy. All I want is to reach my bike ready to race. At least I can ride. Despite the somewhat erratic training since Epic Camp I seem to have sustained bike performance. The power meter remained at home so it’s hard to precisely gauge, but I feel strong. The new bike rides well and the only area of uncertainty is my apparently elevated heart rate. I can’t say whether that’s a consequence of riding harder, the new position, conditions or perhaps lacking an edge in bike fitness; it doesn’t really change my race. Pacing will be key. The course demands control and a managed effort – not spiking too much on hills nor pushing too hard on fast descents. The first stretch on Lakeshore Road is deceptive, it feels fast, but can lure you into working harder than you should. Northshore throws more challenging climbs at you, followed by a long drag to the turn around. I will be watching my effort until that turn, then the pace picks up; there may be a headwind, but I plan to push from that point on. The Three Sisters are a small pain, the overall ascent along the Mountain Trail is more significant, but the terrain suits me. Fuelled and paced correctly I can ride hard. The real problem comes after T2. This year I have consistently run thirty minutes to an hour slower for Ironman marathons. At Immenstadt last year I averaged 4:16 per kilometre, recent training suggest I’ll be doing well if I’m within 40 seconds of that. I survived the marathon in Henley by not crossing five minute kilometre pace. It’s not going to be a fast run. I am in Vegas, I could gamble, but the pay off at the Outlaw was my slowest marathon yet. Alternatively I could adopt the Henley approach and run at a pace I know will see me to the finish. The temptation to try for more is strong, there’s a degree of pressure and this is a World Championship. It’s only thirty kilometres and I’ve tended to suffer the most in the final 10K of marathons. I’m going to spread my bet. The first two laps will be controlled, the second two I’ll take my chances. That’s the plan. 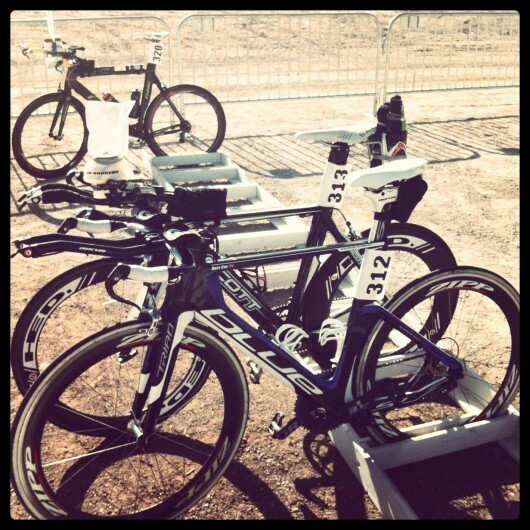 Easy swim, hard bike, whatever comes on the run. I’m not nervous, I’m looking forward to the race; going hard on those roads should be fun. But this is the last time I make excuses or mention injuries. Next season I intend to be back and racing better than before.